Often referred to as a “Pioneer for the Modern Movement”, Charles Rennie Mackintosh was a talented architect, artist and interior designer. His distinctive style was created by the use of Scottish, Japanese and Celtic influences along with fluid Art Nouveau lines and symbolic modernist shapes. His unique, innovative style has achieved record prices at auction ensuring Mackintosh worldwide acclaim as one of the most celebrated designers of the 20th Century. Born on 7th June 1868 in Glasgow, he was the second son in a family of eleven children. Born with a contracted sinew (club foot), doctors prescribed lots of exercise in clean fresh air and encouraged more family holidays. This pleased Mackintosh as it gave him the opportunity to explore and use his artistic flair by sketching countryside scenes. From an early age Mackintosh had an ambition of becoming an architect, a dream that was realised in 1884 when he gained employment as an apprentice at John Hutchinson’s architectural company. Shortly after, he took a position as draughtsman for Honeyman in Keppie where he was made partner in 1901. Alongside his architectural career Mackintosh studied at the Glasgow School of Art where his flair for drawing continued to flourish. He won many prizes including the Alexander Thomson Travelling Scholarship in 1890, which allowed Mackintosh a trip to Italy, to study the architecture. On his return he made friends with a fellow architect, Herbert McNair who also worked at Honeyman and Keppie. They both wanted to experiment with more decorative styles and attended the Glasgow School together. Two sisters, Frances and Margaret Macdonald were also students at the school and showed the same understanding of design as Mackintosh and Herbert. Under the guidance of Frances Newberry, the headmaster, he brought the four together and exhibited their work at a school exhibition. They soon became known as “The Four” and their “new style of Art” stood apart – this style is known today as the “Glasgow Style”. “The Four” continued to work closely together and began to experiment with other materials by producing designs for furniture, stain glass and metalwork. So tight knit were the group that Mackintosh married Margaret in 1900, just one year after Herbert had married her sister Frances. Mackintosh continued to work at Honeyman and Keppie, and in 1897 was awarded the prestigious commission of designing a new building for the Glasgow School of Art. Constructed over two phases due to lack of funds it was finally finished in 1909. This was to be Mackintosh’s masterpiece as the building and its interior is a representation of his finest work and is definitely worth a visit. Other projects that Mackintosh is renowned for working on include his marital home (The Mackintosh House). Together with his wife Margaret, they transformed the interior by experimenting with colour and design. It was filled with Mackintosh sculptural furniture such as the high-back chair, and stylised cabinets. 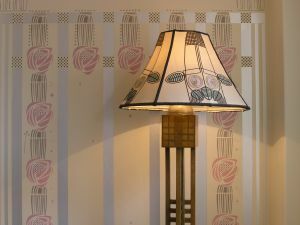 It also heavily featured the distinctive rose motif, which is so recognisable as Mackintosh. Today th e contents of their home at Florentine Terrace reside at the Hunterian Art Gallery in Glasgow. A dream project came in the form of a competition in a German design magazine. Entrants had to design “a house in a thoroughly modern style”. Mackintosh entered with his drawings for “The House of an Art Lover” he didn’t win, but the judges were so impressed with his drawings that they later reproduced them as prints. “The House of an Art Lover” was Mackintosh’s idea of his dream home and was eventually constructed between 1989 and 1996 in Glasgow by using his original drawings. The nearest Mackintosh ever came to producing his own dream home was a private commission for the publisher, Walter Blackie. This famous domestic project is known as “The Hill House”. Walter was so in owe of Mackintosh’s work that he asked him to design a family home. Once completed, Walter was so impressed with the finished result that he lived in the home until his death. 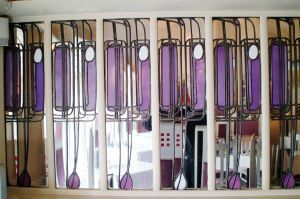 The “Willow Tea Rooms” owned by entrepreneur Kate Cranston was another of Mackintosh’s most celebrated projects. Kate gave him complete artistic freedom to design the interior. The rooms were filled with screens, high-back chairs, light fittings and he even re-designed the exterior façade. These rooms have since been recreated so that visitors can enjoy their afternoon tea in true Mackintosh opulent style. By 1913 Mackintosh was getting very little work, his last public commission was for the Scotland Street School in 1906, so he left his practice Honeyman and Keppie and moved to London with Margaret. He started to paint watercolours of flowers and experiment with textile designs. Companies such as Liberty & Co and F.W. Grafton took some of his designs but when he moved to France in 1923 it was virtually the end of his design career. He painted some watercolours for an exhibition at the Leicester Galleries but then had to return to England when struck with ill-health. Charles Rennie Mackintosh passed away at the age of 60 in 1928, four years later Margaret joined him. Mackintosh achieved so much in his lifetime but it was not fully appreciated until long after his death in the early to mid 70s. 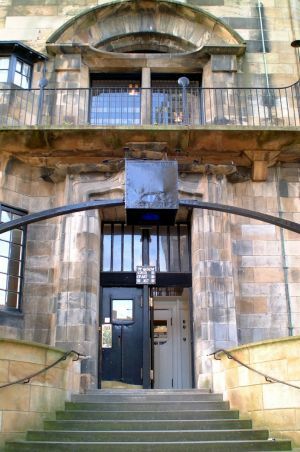 The Charles Rennie Mackintosh Society was founded in 1973 and was set up as a registered charity to work on behalf of the Mackintosh heritage. The Society is responsible for the conservation, preservation, maintenance and improvement of buildings and artefacts designed by Mackintosh and his contemporaries. They also ensure that they educate the public in his works by holding exhibitions and lectures. They now boast 1500 members worldwide and continue to work energetically on the heritage. 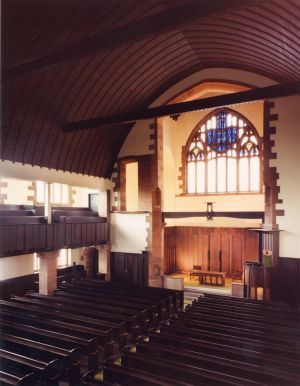 The Society are currently working on a major programme of refurbishment at their headquarters which is the Queen’s Cross Church, this was the only church designed and built by Mackintosh. Mackintosh designs really began to get public acclaim when in 1975 Sotheby’s auction house held a sale of his work and the high-back chairs sold for record prices. Just four years ago in 2002 a private collection was placed under the hammer at Christies, the entire auction fetched £3.2 million with a star lot being a jewel-encrusted writing bureau from Walter Blackie’s “Hill House” which realised £996,000 and one of the high-back chairs from Kate Cranston’s tearooms m ade £380,650. A highly accomplished artist and designer, Mackintosh was way ahead of his time. He has left behind an artistic legacy and is considered to be an architectural icon. His simplistic stylised ideas excelled in some many different areas, making him the contemporary design genius that we know today!